The Call of Duty series, on the Wii, started with the Wii launch and Call of Duty 3. All of the Call of Duty games on the Wii have been developed by Treyarch, even Call of Duty: Modern Warfare Reflex; which was a port of Call of Duty: Modern Warfare from the Xbox 360, PS3, and PC. Do Wii owners enjoy the Call of Duty games? Let's take a look! Call of Duty 3 has 271,237 players reporting play-time data, since it released in November 2006. Call of Duty: World at War has 211,013 players reporting play-time data, since the game released in November 2008. Call of Duty: Modern Warfare Reflex has 81,438 players reporting play-time data, since it released in November 2009. 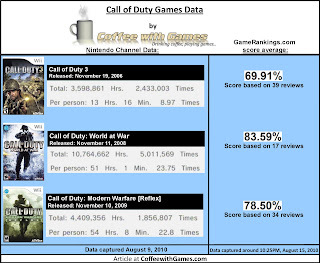 Call of Duty 3 has 3,598,861 Total Hours reported, with 13 Hours 16 Minutes averaged per person reporting data. The average play-time per person, per play session, is about 1 Hour 29 minutes. Call of Duty: World at War has 10,764,662 Total Hours reported, with 51 hours 1 Minute averaged per person/console reporting data. The average play-time per person, per gaming session, is about 2 Hours 9 minutes. Call of Duty: Modern Warfare Reflex has 4,409,356 Total Hours reported, with 54 Hours 8 Minutes averaged per player reporting data. Its average play-time per gaming session is about 2 Hours 22 minutes. Call of Duty 3's Amazon.com sale rank is #1,473, and the current advertised listed price is $69.00. Call of Duty: World at War's Amazon.com sale rank is #730, and its selling for $29.26. Call of Duty: Modern Warfare Reflex's Amazon.com sale rank is #483, and is selling for $40.54. The image above in the article shows the GameRankings.com review score averages for each game, and the number of "professional" reviews associated with each game. Call of Duty 3 has a 3.5 out of 5 Star rating, based on 71 customer reviews. Call of Duty World at War has a 4 out of 5 Star rating, based on 90 customer reviews. Call of Duty: Modern Warfare Reflex has a 4.5 out of 5 Star rating, based on 63 customer reviews. I think it's interesting that Call of Duty 3 has 60,224 more players reporting play-time data, than Call of Duty: World at War. I really thought Call of Duty: World at War would have more players reporting data, because of its online multi-player. I guess the two year head-start of Call of Duty 3 is the main reason it's still leading. On Friday, I posted the article, "What Is the Most Played FPS Game on the Wii?" I reported that Call of Duty: World at War is currently the most played FPS Wii game, according to "total game-play hours reported, not just the average hours per person/console." A reader, WesFX, asked in the comments section of the article, "So does the trophy for most hours played per individual go to a different game?" While Call of Duty: World at War is the Wii's most played FPS according to "Total" game-play hours reported; the trophy for most hours played per individual goes to Call of Duty: Modern Warfare Reflex. As the data picture shows and I stated above, Call of Duty: Modern Warfare Reflex has an average of 54 Hours 8 Minutes per player reporting data, about 3 hours higher than Call of Duty: World at War's average. 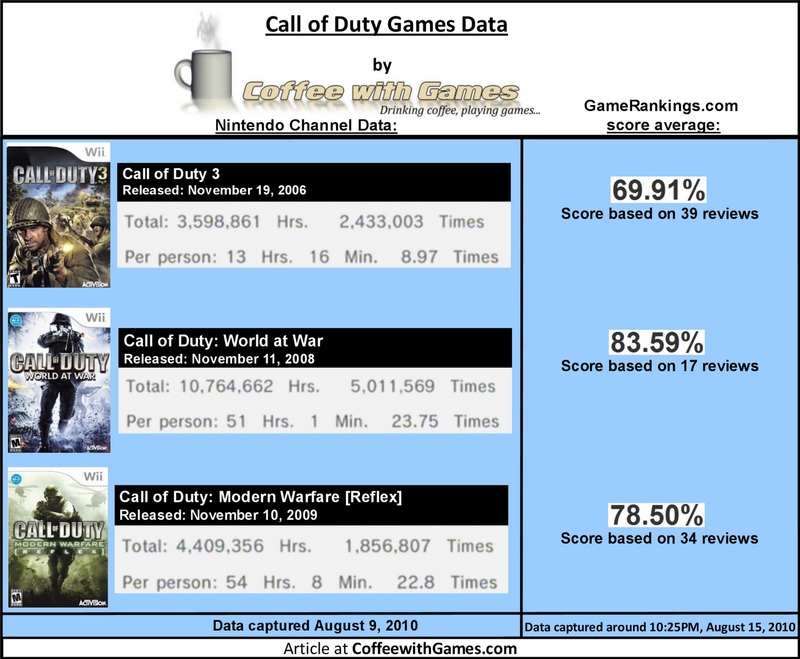 I think the play-time data for the Call of Duty Wii games clearly shows Wii owners enjoy the online aspect of the games; especially when considering Call of Duty: Modern Warfare Reflex passed Call of Duty 3's "total hours" reported, only a few months after it released this past November. Have you played any of the Call of Duty Wii games? If so, are your average hours per game close to what is being reported? This actually isn't too surprising when you think of the games overall. Call of Duty 3 was a weak entry for all systems, and the Wii version was pretty rough. So after a short period of time, you could find this on a steep discount at $15-20. Given the name brand and the price point this is a significant value for many consumers. Playtime indicates that people played through the campaign, maybe dabbled in Multiplayer and had their fill. World at War has double the amount of players and total play time and has been out about twice as long. This is still very popular among Wii consumers as evidenced by the fact you still see it on shelves at $40 new despite having the next version out. At almost 50 hours of gameplay, it speaks to the quality of the multiplayer Treyarch acheived with this release. MWR, the new kid on the block and the most expensive. But Modern Warfare is Modern Warfare so people are playing the hell out of it. The 54+ hour average shows that this is the most robust multiplayer offering so far, and buyers are soaking it up. Overall, I think that consumers will begin to tire of an annual, or multi-annual Call of Duty offering, and I definately see a sharp decline in FPS popularity as soon as someone comes up with a new idea. It has become too saturated, on Wii however, consumers have benefited from annual releases as each one has improved in quality. If Black Ops continues this trend, it should do quite will on Wii. You might have surmised this from my last post on the subject of Wii FPSs, but I have not played one of the Wii Call of Dutys. Getting more and more tempted by Reflex, though. I think delawaregamer makes some great conjectures about why the play times are the way they are. WAW was a really good game, both single and multiplayer. But at this point in time with Reflex still $50, and just over two months til Black Ops comes out, it might be prudent to wait for that release to get the best value. Among other things, it will apparantly have a dedicated headset voice chat which will be a first for the series on Wii. I don't know why, but I always thought COD3 only had a single-player campaign on the Wii. I saw it lists multi-player as an option though, so it must have been local only? I also agree that annual releases of series may fall under the phrase, "Too much of a good, can be a bad thing", overall. I agree with delawaregamer, that you may want to wait for Black Ops in November. I passed on Reflex, due to no voice chat and I thought it was a quick port...but from what I have read the game is the most solid online FPS on the Wii. If Treyarch was able to port CoD:MWR to the Wii in about a year's time, I have even more hope for Black Ops with a full development cycle. I am glad and interested in the Wii headsets being released with Black Ops and Conduit 2. I really hope they work well, because I don't think Wii Speak is a good choice for FPS/action games with a lot of noise going on.